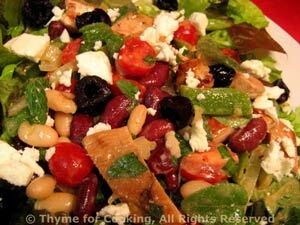 Salad with Turkey, Beans and Feta, quick, easy gourmet recipes. We get turkey cutlets which are thinly sliced (about 1/4", .6ccm) and have them a lot in the summer. I know they are not available in all markets. If you can't find them, get a turkey tenderloin and either have the butcher slice it or do it yourself, freezing part of it for later uses.... Or use chicken breasts. Finish the red pepper from Friday. I can get small cans of beans so I like to combine different types and colors. If you only have access to the 15oz (450gr) cans or jars use all 1 type/color... which ever you prefer. The turkey cooks quickly, either on the BBQ or in a nonstick skillet. Mix all ingredients for marinade, spoon on to turkey and set aside. Mix garlic, vinegar and mustard. Open and drain the beans. Clean and slice the pepper into bite-size sticks. Cut the tomatoes and olives in half. Wash and spin-dry the lettuce. Tear the lettuce and put into a large salad bowl along with the oregano. Cook turkey on barbecue grill or sauté in nonstick skillet until done, 4 - 7 minutes per side, depending on thickness. Remove and let rest while assembling the salad. Add beans, peppers and the rest of the vinaigrette, toss well. Add turkey, tomatoes and olives, toss gently. Sprinkle with crumbled feta and serve.